In which I tell you what I did on my holiday. With graphs. So that’s quite a mix. Shall we have a look at precisely what sort of a mix. Yes. Yes. We shall. 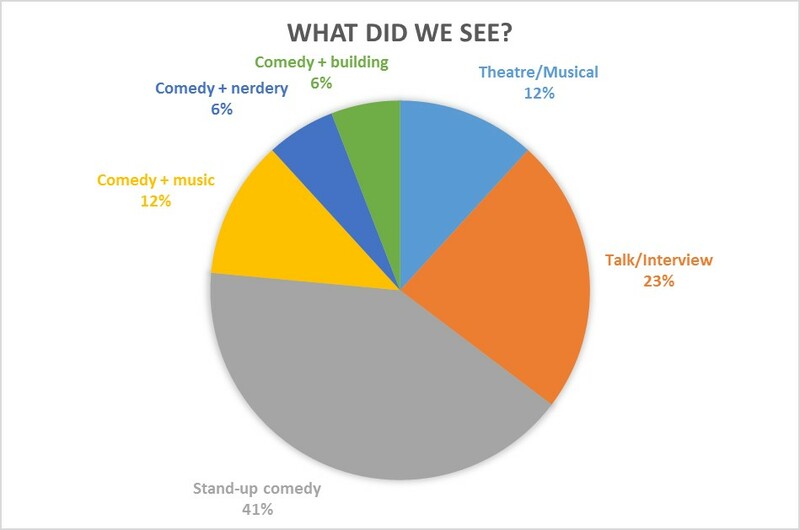 So that shows a bit of a bias towards stand-up comedy, which becomes more marked if you factor in the ‘Comedy +’ events. But comedy is marvellous, and we got in some talks by proper scientists with Professor in front of their names as well, so it’s all good. 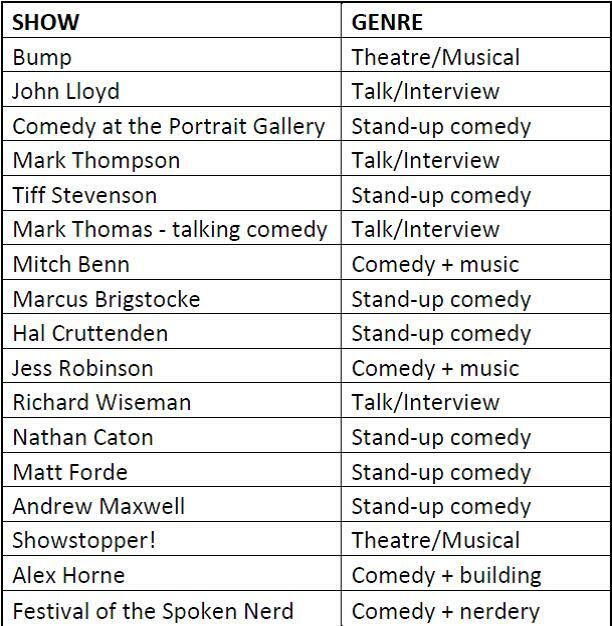 My top scorers there are the impressively eclectic pairing of the Festival of the Spoken Nerd and Showstopper! The Improvised Musical. Both of those shows were fantastic. The first is Helen Arney, Steve Mould and Matt Parker who do comedy about science and maths, and set fire to stuff. The second is an entirely improvised musical. One of them included an entirely brilliant pastiche of a song from Wicked! and it’s not the one you’d expect. 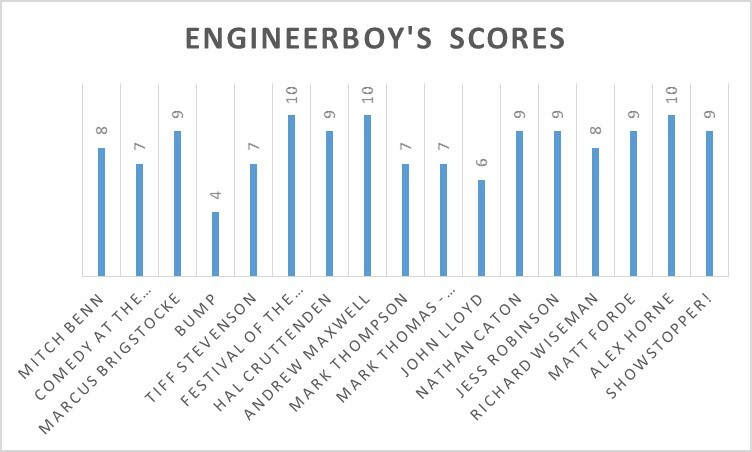 It’s no surprise that EngineerBoy also liked the Spoken Nerds. He wore his ‘Stand back – I’m going to try science’ t-shirt most of the time we were in Edinburgh so going to see the nerds was really a trip to his personal EngineerBoy happy place. He also gave perfect scores to Andrew Maxwell and Alex Horne. Andrew Maxwell probably suffered slightly on my list because he was one of my favourite acts of the fringe last year, and so expectations were very very high. He was very very good, but I expected him to be, so didn’t have the thrill you get when a performer exceeds expectations. That was probably deeply unfair scoring on my part, but it’s my blog, so tough. We saw Alex Horne performing his Monsieur Butterfly show in which he… well he sort of… well it involves…. erm… well you should definitely go and see it if you get the chance. It was brilliant. Weird. But brilliant. So there you go. 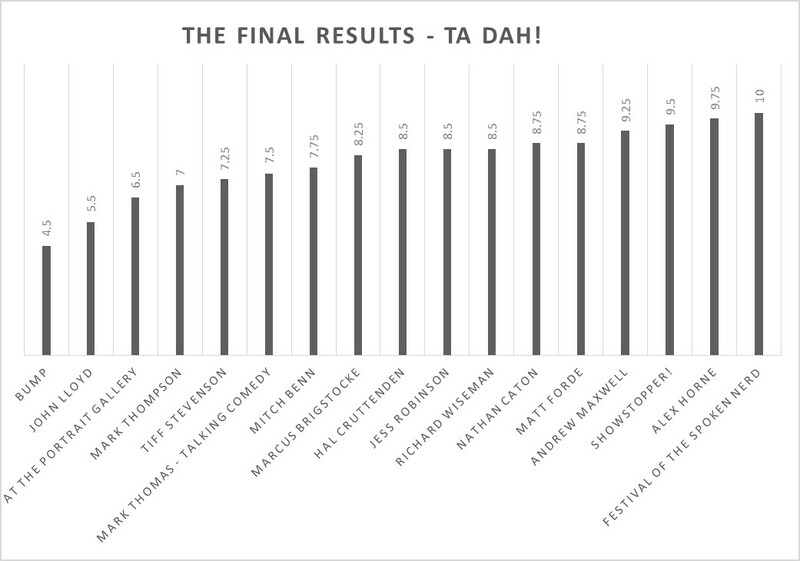 The Festival of the Spoken Nerd are officially and indisputably the best show of the fringe 2015. Good to have that cleared up. A quick mention as well for the two acts tied in fifth place on the overall chart. Matt Forde is a political comedian and impressionist who does a hysterical Ed Miliband impression – see him now before we all forget who Ed Miliband is. And Nathan Caton was probably the act who most exceeded expectations, I’ve seen/heard him a couple of times on TV and radio and thought he was ok, but live he was very good indeed – relaxed, consistently funny and with a particular point of view that differentiated him from the mass of stand-ups we saw over the four days at the fringe. 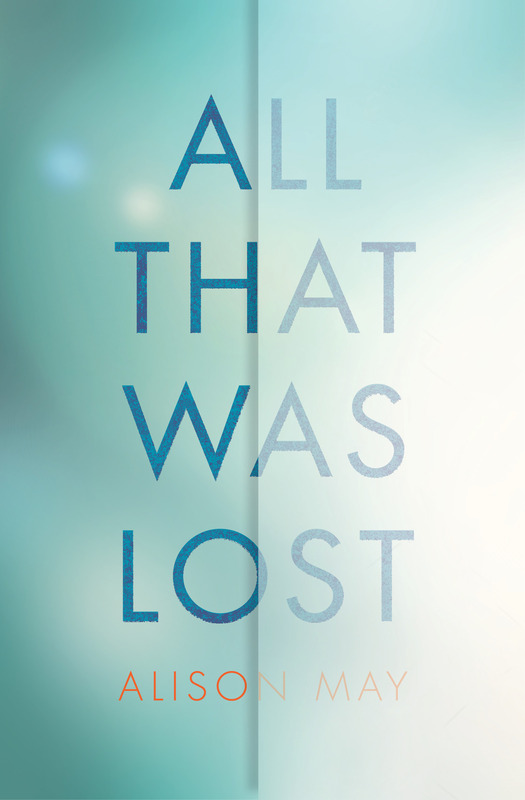 And as ever now you finished being blogged at, you could consider buying a book. Sweet Nothing is out in paperback now you know, and it involves comedy, romance and maths, so is potentially pleasing to nerds and non-nerds alike. *Technically mainly charts. Yes. I know. ** ‘Right’ – ie. how I think they should have been. 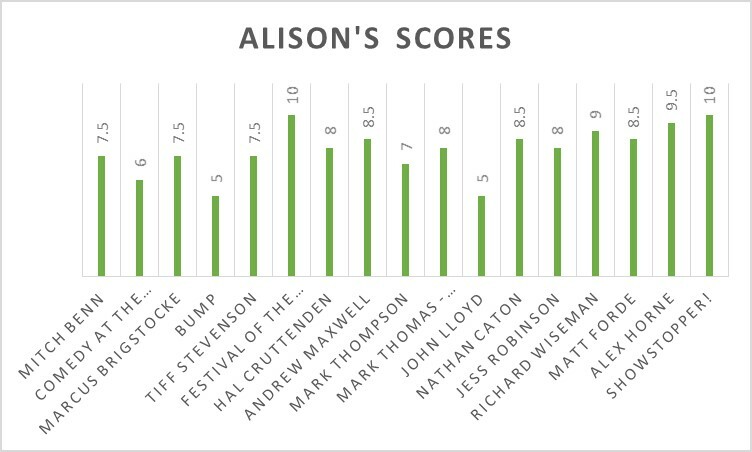 Author Alison MayPosted on August 19, 2015 Categories Reading & other reviewsTags Alex Horne, Andrew Maxwell, comedy review, Edinburgh Festival, edinburgh fringe, edinburgh reviews, festival of the spoken nerd, improvised musical, Jess Robinson, Matt Forde, Nathan Caton, Richard Wiseman, Showstopper, stand up review2 Comments on In which I tell you what I did on my holiday. 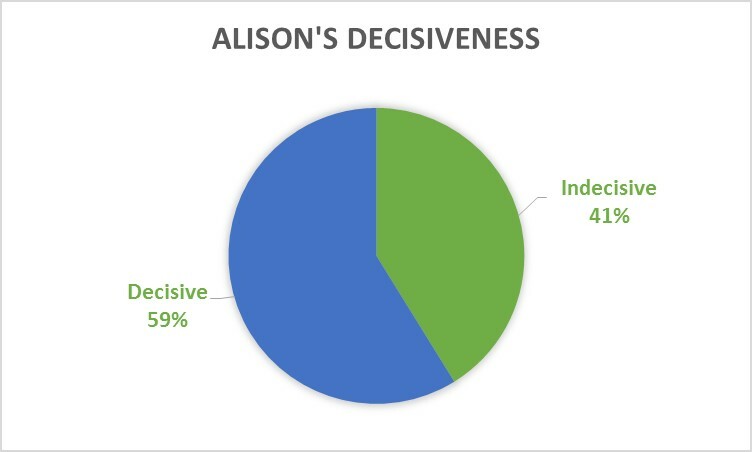 With graphs.